Heat wave for the holidays! We’re flexible. To cap an amazing fall season, the girls cross country team won their fourth consecutive State Championship title! The boys placed fourth, and Evan Pattinelli ’18 came in first individually at CIF State. Incredible work, athletes! Dates for the 2018-2019 school year are on the online calendar. Visit www.flintridgeprep.org/calendar. Please note that these are subject to change. We urge you to verify dates online. Thank you to all of the students and parents who spent time with visitors and helped make the day a success. Please remind any of your friends who are applying that the deadline is January 12. If you will be applying for financial aid for the 2018-19 school year at Prep, we will be using the ISM FAST online application. The deadline is January 29, 2018, and copies of tax returns will be due February 9, 2018. Find detailed information here. Read the latest installment of Conversations in Education, a blog for parents that organizes interesting topics in education. You can find the blog, which is published monthly, by clicking here or by visiting the Parents Portal. From the blog page, you can subscribe by clicking the blue Alerts button at the top of the page. December 23 is going to be quite a day for Rebels alumni! We have four events on campus: Alumni Sports Day; Alumni vs. Students ComedySportz; the fourth annual Graduates of the Last Decade Career Networking Mixer; and the Five- and 10-Year Reunions for the Classes of 2007 and 2012. Off campus, all alumni are invited to the annual Alumni Holiday Party in Old Town Pasadena at Ix Tapa. Additional details can be viewed here. Thank you to the junior class parents for their attendance and amazing generosity at the Junior Parent Dinner. A big thank you to the junior class for all their thoughtful donations; it was a huge success! We are grateful to everyone for their support of the Class of 2019! The winter season is underway, with girls and boys basketball vying for championship tournament crowns. The boys and girls soccer teams are loaded with talent and will be tested early with tough preseason matchups. Girls water polo has a record number of participants and are eager to build on last year’s progress. Come on out and cheer on the Prep athletes! Before the Thanksgiving break, the ACL finished the month of November with tutoring at the Boys and Girls Club, decorating and giving gift bags for the children at the Euclid Villa Homeless Family Center in Pasadena for Thanksgiving and the Penny Wars fundraising between 7th through 12th grade classes for the Tecate Initiative, which raised $2,469.00 in the last two weeks before the break. The funds will be able to supply much needed blankets, food and toys for the community of Tecate, which is often overlooked because of its remote location. Seniors will be receiving admission decisions for the early round beginning the week of December 11. We encourage students not to post decisions on social media and to check admission decisions at home. These decisions are personal, and we’d like to remind seniors to be supportive and kind to one another. College counseling class has ended for seniors; however, we are continuing counselor check-ins during their class time through the end of the semester. We do not teach this class for seniors in the spring semester. Counselors have begun editing essays for upcoming application deadlines and will return edits by Friday, December 20 before the holiday break. Juniors have received a packet of information in the mail launching the college process. Included students will find login codes for Naviance, which will give them access to the summer internship database. By logging into Naviance, interested students may begin to search for summer programs, some of which have January application deadlines. Students with questions about summer programs may contact Ms. Ventura at gventura@flintridgeprep.org. Counselor Assignments: We are in the process of assigning juniors to a college counselor. This a thoughtful process, which includes input from Midge Kimble and Katie Canton. We will post counselor assignments outside the college counseling office door on Monday, January 8. Testing: The college counseling office recommends taking the SAT in March 2018 or the ACT in April 2018. The College Counseling office hosted College Testing Night on Tuesday, November 28 to inform parents and students of the differences between the ACT and SAT exams. If you have questions, contact the college counseling office at (818) 949-5510. Sophomores: College Night for sophomores and their parents will be held Thursday, January 25 at 7:00 pm in Norris Auditorium. We will welcome a panel of speakers who will highlight the ways in which the college process serves as a foundation for the student’s human development growth. The keynote speaker for the event will be Maria Furtado, Executive Director of Colleges That Change Lives, a non-profit organization dedicated to the advancement and support of a student-centered college search process. Joining her will be Dr. Kimberly Prater, psychiatrist and founder of Psychology Resource Consultants specializing in teen patients, and Andrea Paz Frost, Southern California Regional Director from Stanford University. The Fathers Club is in full preparation mode for next semester and beyond. One key initiative is expanding our internship program. On Alumni Day, December 23, we are meeting with the GOLD (Graduates of the Last Decade) alumni to network and discuss opportunities for internships within the Prep community. With a number of open internships and more to come, we look forward to reaching more alumni with news of these opportunities. Prep for Life in action. We are also working with current students on an opportunity for detailed work in applied math, statistics and probability. Casino night only comes once every two years with the next one being January 27, 2018. The students have a lot of fun and have the opportunity for some great prizes. We hope to see them all there. All juniors will go to a place of business on April 25, 2018, for Junior Internship Day. If you have a fascinating career to introduce to students, please email Co-Director of Alumni Relations Colleen Bissner or call at (818) 949-5523. Thanks to our hospitality chairs, Michelle Lytle and Annette Starks and their parent volunteers who decorated Prep’s living room, making it a warm, festive place to ring in the holidays. Look for our SignUp Genius email this month to nominate someone or express your own personal interest in volunteering for a leadership role in the 2018-2019 Parents Association. Please contact Debbie Pitts, Parliamentarian with any questions. In this interactive discussion, Nick Ponticello, Barrett Jamison and Ingrid Herskind will demonstrate what students experience through the school’s burgeoning STEAM, Leadership and Global Studies programs. Don’t miss this chance to experience how our teachers work across curriculums to prepare our students for life. Susan Stiffelman is a parent coach for the Huffington Post, a marriage and family therapist, a credentialed teacher and a licensed psychotherapist. For over 30 years, she has worked with families to create greater harmony and deeper connections between parents and children. If you missed our last Community Speaker Series, the Screenagers movie followed by a panel discussion, click here for a recap of the event. Congratulations to the instrumental and dance programs for two incredible concerts! Audiences experienced many great performances by our students, and we salute their many efforts in putting together inspiring and fun-filled evenings. You are invited to the Flintridge Singers Holiday Coffee House this upcoming Saturday, December 16 at 6:00 PM in the Miller Theater. You can enjoy an array of fine vocal performances from Eighth Grade Girls Chorus, Flintridge Singers and a feature spot by our Eighth Grade Instrumental Ensemble. We hope to see you there! Coming up in January: the Middle School Talent Show on January 25th at 1:15 pm. Details to follow soon! The Performing Arts Department will proudly present the Winter Play, Carlo Goldoni’s The Servant of Two Masters, January 18-20 in the Miller Theater, featuring a cast of actors from grades 7-9. This freely-adapted production reframes this hilarious comedy in 1940’s Gangland, celebrating the exploits of an array of outrageous characters: crime bosses, foolish lovers, a gutsy woman disguised as her brother, and its title character—a crafty servant who brings the plot to its chaotic resolution. The Servant of Two Masters takes the Miller Theater stage Thursday, January 18, at 7:30; Friday, January 19, at 7:30; and Saturday, January 20, at 2:00 and 7:30. Admission is free. Note to 7th grade parents: All semester exams for 7th graders will be in the gym from 9:00 am to 10:30 am. Please do not pick up your 7th grader before 11:00 am, as we keep the students in the gym to reduce distractions for the other students still taking exams. The Writing exam will be on Wednesday, December 19, and the Literature exam will be on Thursday, December 14. 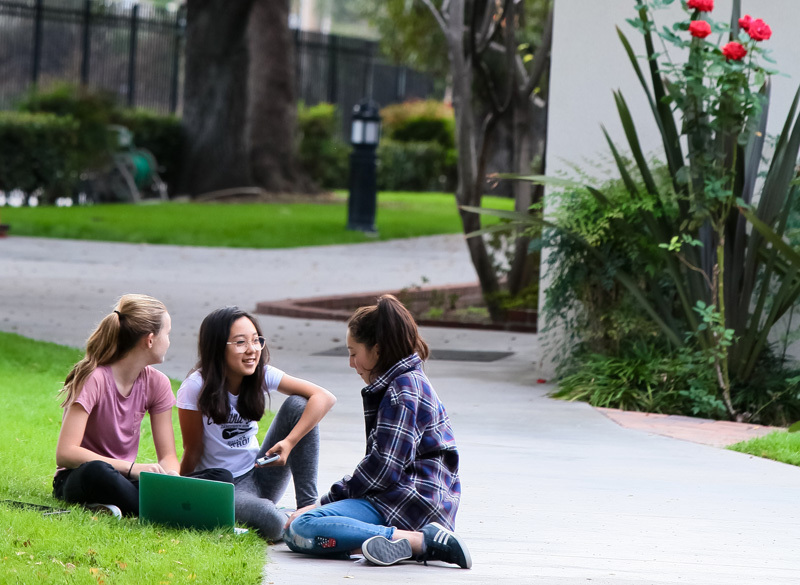 Flintridge Prep's annual STEAM & Service Fair will include traditional science fair projects, community impact and service projects, robotics, engineering, photography and more. The fair will be held February 8. Good luck to students on exams. Please enjoy the holidays.